Your travel dates are set and your quote is ready. Please click the "Contact Manager" button below to receive your quote OR view rates here. 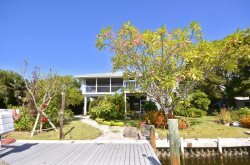 Beautiful 2/2 stilt home with great access to the GULF! Bokeelia, Florida is home to some of the world's best fishing grounds, and it's all at your fingertips when you stay in this magnificent & spacious 2 bedroom/2 bath waterfront heated pool home with boat lift. You are located on one of the best access canals on the island and mere moments from Charlotte Harbor, Pine Island Sound, and Matlacha Pass. Trout, Snook, Redfish, Grouper, and Tarpon are just some of the fish you will find nibbling at your line. It is less than 5 miles to world renowned Boca Grande Pass, home to some of the world's most active tarpon fishing tournaments. You can also sit on the large outdoor screened lanai where you can see straight down the canal and enjoy the amazing sunsets and beautiful weather of Southwest Florida. If you are more of the kayaking type, there are plenty of protected waterways along Jug Creek and Pine Island Sound that are great for kayaking. Bokeelia is a peaceful little town, perfect for the nature lover looking to enjoy all their surroundings. Call us today at (239) 283-0909 to book your stay in this beautiful home. • Boat lift, 7,000 lb.